July 14, 2015, 8:38 a.m.
As tattoos have become increasingly common, so too, have become tattoo removals. Removal specialists Premier Laser Clinic report a 25% increase in removal requests over the past two years. Tattoos of the names of ex-lovers, dolphin tattoos and misspelt foreign quotes are cited as the most regrettable body art. But just how many people regret their tattoos? According to a new YouGov survey, nearly a quarter of Americans (24%) and around a fifth (19%) of British adults have ever been "inked" (plus 2% in America and 1% in Britain who "prefer not to say"). 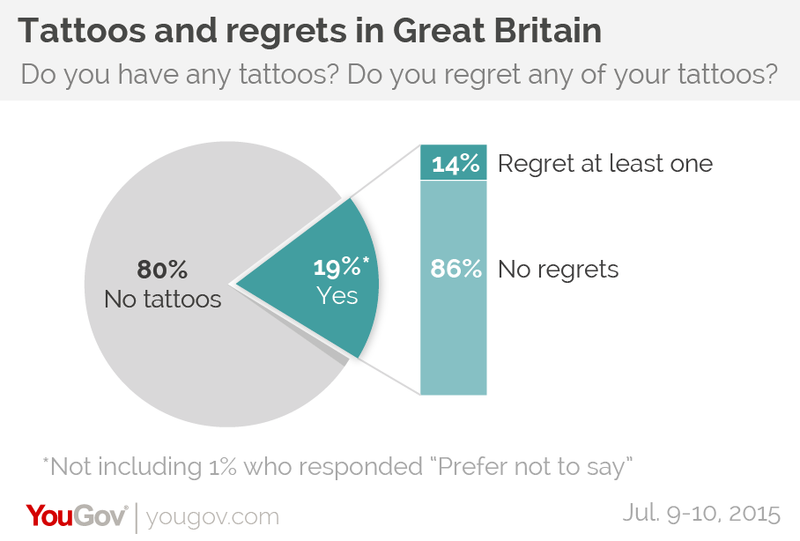 Of those, 22% in the America and only 14% in Britain have any regrets – in other words, the overwhelming majority of people with tattoos have no regrets. The survey finds tattoos continue to be something of a taboo for many people, despite or perhaps because of their popularity with celebrities like actress Angelina Jolie, pop star Cheryl Cole and footballer Zlatan Ibrahimović. While 44% of British adults say they would think no differently about someone if they noticed he or she had a large tattoo, people are much more likely to think less positively of the person than more positively, by 36-3%. Given the size of the subsamples*, precise estimates about the views and characteristics of people with tattoos are difficult to make based on the poll. Tattoos do appear to be more popular with younger generations than older ones. In the United States, fully a third (32%) of 18-44 year olds have at least one tattoo, twice the number of Americans ages 45 and up (16%). According to the survey half of people with tattoos in America and Britain got their first tattoo by age 21, while half afterwards. 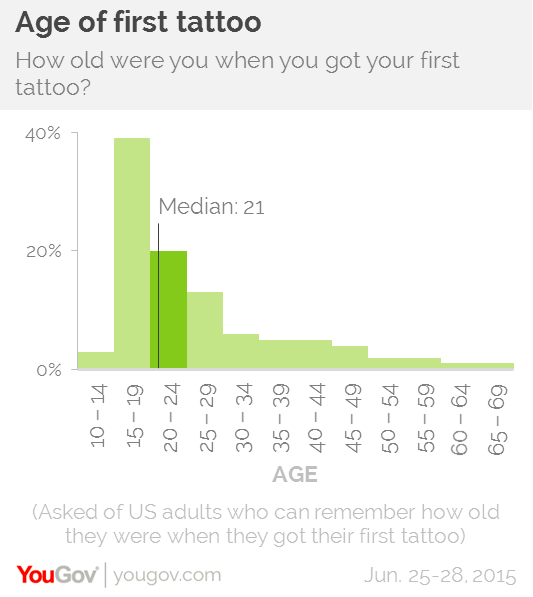 A closer look at the United States data shows four in ten (39%) got their tattoo between the ages of 15 and 19. But many do get tattoos later in life – one in four got their first tattoo after they turned 30, and one in ten after 45. Waiting could also be wise: US respondents who got their first tattoo before their 21st birthday are far more likely to have a tattoo they regret than those who got it after (38% versus 7%). 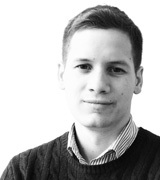 The public may have some sense of the risks of committing to something so permanent at an early age. Virtually everyone, 85% of respondents in America and 83% in Britain say the minimum age for getting a tattoo without parental consent should be at least 18. In Britain, a third (31%) even say 21 should be the minimum.